After meeting his French and German counterparts, Vladimir Putin held informal talks with Petro Poroshenko in Deuville, France, and the two sides agreed that a Russian representative would visit Ukraine to work on resolving conflicting issues. Ahead of last week’s celebrations in Normandy to mark the 70th anniversary of D-Day, the Western media wrote about the isolation of Russia and the beginning of a new Cold War. The sceptics were, however, proven wrong. On June 6 in Deauville, France, Russian President Vladimir Putin participated in meetings and held informal talks with his Ukrainian counterpart Petro Poroshenko as well as leaders of Western countries. The parties made statements about the need for an early end to the bloodshed and finding a peaceful resolution of the conflict in eastern Ukraine. Of course, all the attention was drawn towards Vladimir Putin and Barack Obama. When the leaders of 18 countries posed for photographers at the entrance to the Benouville Castle, before the reception for the guests of honour, the presidents of Russia and the U.S. deliberately avoided each other. However, once inside, they still met face to face for the first time since the start of the Ukrainian crisis. Despite the absence of public speeches, curious statements of the Russian president leaked through to the press. According to the French Foreign Minister Laurent Fabius, in a conversation with President Francois Hollande, Putin acknowledged that he had limited influence on the “separatists.” Taking an example, Putin cited the referendums on independence in the Luhansk and Donetsk regions, despite the Kremlin calling to hold them off. The longest conversation Putin had in Normandy was with Angela Merkel, who seemed the most interested in establishing a dialogue with Moscow. The G7’s latest proposed sanctions against Russia would hit the EU hard in general and Germany in particular. Putin’s meeting with Merkel was held behind closed doors. Eyewitness at the talks – presidential aide Yuri Ushakov – said that “the conversation was mostly in line with the search for solutions and compromises, and not in terms of differences” on Ukraine. 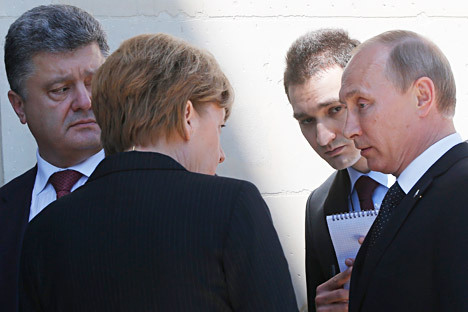 According to Putin, Hollande and Merkel had asked him to speak to the new president of Ukraine. “We sat down at a table and talked for fifteen minutes. We discussed the main issues for a settlement,” he told reporters. Poroshenko shared his plan for a settlement. “His attitude seemed right to me, I liked it,” Putin said about the Ukrainian oligarch turned president. The negotiators discussing Ukrainian problems, according to Putin, should not be Kiev and Moscow, but Ukrainians and representatives of the southeast. For a truce to be established, the Kiev authorities must stop their punitive military operations. Speaking about the upcoming Association Agreement of Ukraine with the EU, Putin said that Russia would not abandon taking protective measures. Among these will be the abolition of zero import duties, and “for Ukraine this will present an ordeal,” he said. Another protective measure may be changing the ruled concerning Ukrainian citizens living in Russia. The two presidents did not discuss the most painful theme for both countries – the price of gas. “We do not exclude the possibility of meeting the Ukrainians half-way, to support them, if, of course, they pay the debts that have already been accumulated,” said Putin. “The credit risk remains very high... If we see that someone is violating our contracts on gas supplies, we will reduce the supply, and the physical volumes will simply not suffice on the European market,” he warned. Poroshenko also commented on his meeting with Putin, saying that the conversation was not easy, especially when he raised the issue of Crimea. The new Ukrainian leader appreciated that the dialogue had started, although “the mood was very tense.” In particular, it was agreed that a Russian representative would visit Ukraine, to work on resolving conflicting issues. The first contact between Putin and Poroshenko was perceived in the U.S. as a “positive development” of the situation. White House officials even hinted that, if Moscow will work with the new president of Ukraine, this would open the door to improved relations with Washington.